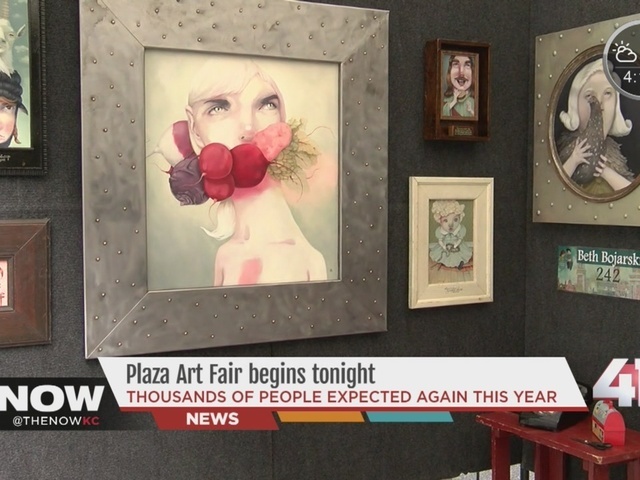 While Kansas City's largest art fair has drawn Milwaukee artist Beth Bojarski to the Plaza for several years, this year is the first year she's front and center as the festival's featured artist. "The great thing about doing the art fairs is that I know where all my work is,"said Beth Bojarski. "I may not be going to the home but for the most part I know everyone who was bought my pieces." Which is a relief for an artist like Bojarski who doesn't simply paint people, she creates characters with a personality and a history and a story. "They have a little bit of edge," she said of her whimsical paintings. "You have to go up and meet them. You see them from a distance and you might think, 'what's happening there', but then when you go in and you engage with it and you spend time with them they're all just, I believe, lovable characters, lovable people. Bojarski is just one of the couple hundred purveyors who come from the east coast, the west coast and the no coast to share their works. And while art's in the title, the Plaza Art Fair said this festival is so much more. "I think the vibe is so cool," said Plaza Art Fair organizer Jan Cichello. "We have 240 artists. We have 23 restaurants. We have three live music stages with 50 different acts. We have a whole street dedicated to children's activities." Which is the one of the reasons artists like Bojarski come back to the Plaza Art Fair year after year - to expose the people who meander by to a different style of artistry, and in return, leave inspired by the people and paintings they've come across. Bike parking: Bike racks are located in the Granada Garage (near Country Club Bank Drive-Thru), Valencia Garage (top level) and Central Garage (near Classic Cup Café). Other parking: Handicapped parking is available in all Plaza parking lots and garages. Valencia Garage at 47th Street and Pennsylvania have a extra handicapped parking. The fair goes on, rain or shine. You can still volunteer!